Washington D.C., but no date or details. 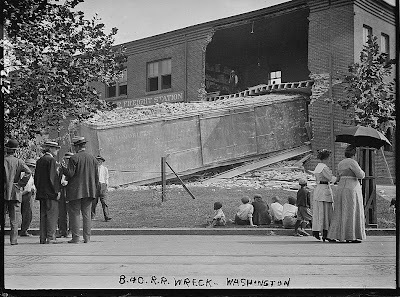 One commenter at flickr, suggests it may have been a 1906 disaster that killed around 60 passengers, but they don't seem to match up: the accident reported in the article happened in December and the photo appears to have been taken in the summer. : Library of Congress, mishaps, transportation, Washington D.C.